First off, Java Needs to be installed so that Tomcat and Solr can run. Because Tomcat is a server app, GUI dependencies for Java are not needed, so installing the headless JRE will do. Note: Since Debian supports automatic dependency resolution, installing Tomcat 7 directly and having Debian decide how to install Java will result in the system using Java 6 instead of Java 7 for compatibility reasons. However, Java 7 will enable the addition of WebSockets in Tomcat 7, better concurrency, the client/server compiler for faster long-term running applications like Web apps, and a better garbage collector1. The following command will install Tomcat server, the Tomcat Web Application Manager and the Tomcat Virtual Host Manager so that the proper installation of Solr can be verified later via a nice web page. Now that Tomcat has been installed, the server should show a welcome page at http://localhost:8080/, assuming Tomcat is running on the same machine. For remote VMs, replace “localhost” with the server IP or domain. 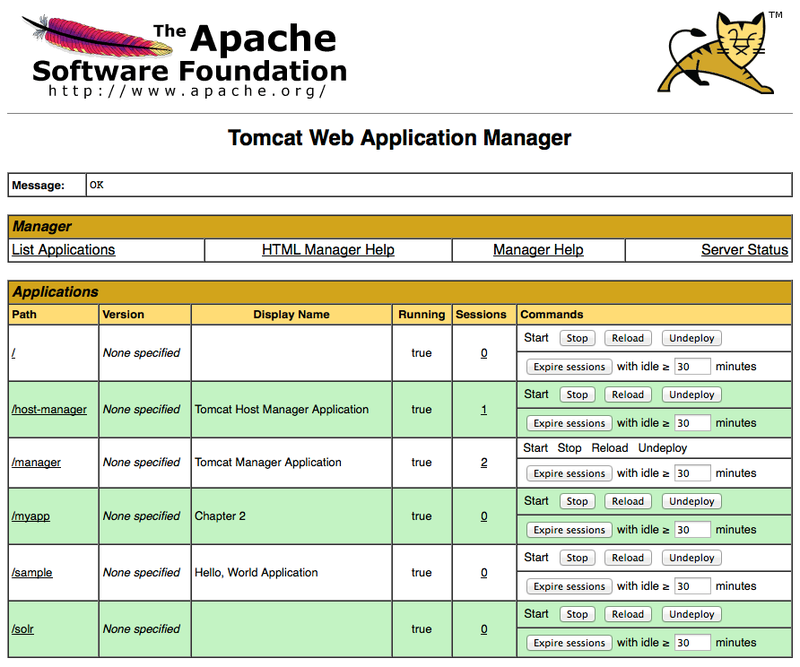 The tomcat7-admin package ships with two Tomcat webapps, the Web Application Manager, and the Virtual Host Manager. However, by default, for security reasons, none of them are accessible. Tomcat’s authentication needs to be enabled in order to access these tools. Save the file and restart the Tomcat server for the configuration changes to take effect. The manager webapps should now be accessible behind the login prompt at http://localhost:8080/manager/html and http://localhost:8080/host-manager/html. Next, the Solr example app that comes bundled with the tarball will be set up. To do that, required libraries must be placed into Tomcat’s classpath. On Debian, simply copy the JARs from ~/solr-4.6.1/example/lib/ext to /usr/share/tomcat7/lib. Note: Tomcat’s classpath directory contains symlinks to the actual JARs in the /usr/share/java classpath folder. The same can be done if desired, but it doesn’t matter in practice. The apparent structure is only an illusion and the symlinks follow a variety of logics for a variety of reasons. Since Tomcat loads libraries regardless of the filename, copying the JARs directly will do. The JARs can always be updated later by simply copying newer versions and removing the old ones in the same folder. Next, Solr’s WAR file has to be placed inside Tomcat’s webapps directory so that Tomcat can deploy the Solr app. Note that by default, Tomcat deploys WAR files to folders with the same name, so once the app is running, the folder /var/lib/tomcat7/webapps/solr should have been created and the server will run from there. The final step involves copying the example app’s support files to Tomcat’s Catalina base folder: /var/lib/tomcat7 and updating the folder permissions to give ownership to the Tomcat server. Catalina is Tomcat’s servlet container, or, simply said, the component of the Tomcat server which interacts with Java servlets. If it’s not, restart the server to make sure the app is being deployed correctly. By now, the Solr app should be running at http://localhost:8080/solr. If port 8080 is publicly accessible on the server, however, as is the case by default for a public Debian VM, the complete Solr admin page is now accessible to the whole Internet without any restrictions. To prevent his, shut down the Tomcat server immediately to avoid exposing the system to attacks. Once the server is stopped, it’s time to set up authentication for the Solr admin page. Even if port 8080 is not accessible publicly, it’s a good idea to set up authentication to prevent unauthorized access by other users on the subnet. To do this, edit the /var/lib/tomcat7/webapps/solr/WEB-INF/web.xml file. This file contains the configurations for the deployed Solr app. This will add app-wide authentication in plain HTTP with a basic password prompt for the role solr-gui. Start the Tomcat server again, and the Solr app at http://localhost:8080/solr should now be accessible with the same username and password previously created. Of course, a separate username and password may be created if desired. This is it. The server should now be running a fully functional Tomcat + Solr setup. Thanks for writing this. The official documentation is not entirely helpful for people not terribly familiar with Java servlet deployment, and all the various options and tools. Near the end of “Installing Solr”, you change permissions, but for a tomcat6-directory instead of tomcat7. Gee, thanks. I fixed it. Thanks for such a nice tutorial. I am stuck after the deployment part. I restarted tomcat. When I log to tomcat-manager and start solr I get “FAIL – Application at context path /solr could not be started” error. I have done exactly what you said verified all the copied jars, but still getting this error. Can you get the localhost log from /var/log/tomcat7? That is, one date instance. No need for the whole thing. Find the error that looks the most relevant. Thanks! Glad to see it helped. I should think about writing more of these. Many thanks mate ! Concise & simple. How to setup Solr in 10 mins. Anyone trying install solr… this is the best tutorial around look no further. It looks like you haven’t defined the solr-gui role, as explained by the error. Maybe look at the full log file for more info and review all steps here. There’s likely something amiss in your /etc/tomcat7/tomcat-users.xml and /var/lib/tomcat7/webapps/solr/WEB-INF/web.xml config files. I have apache, tomcat and solr running. I have a basic home page that is a directory listing of files. How do I configure my home page to use the solr search engine ? Sorry, that’s kind of beyond the scope of this simple article. Grab a book? I’m attempting to install Solr 4.9.0 within Tomcat 7. And I keep getting the above error. Please see my comments with ***(ALL CAPS). THE DIRECTORY ***~/solr-4.9.0/example/solr *** DOES NOT EXIST. Any direction would be greately appreciated. If you didn’t, you may have extracted the solr folder somewhere else completely. The ~ indicates that you’re in the home folder. Why are you using two paths for tomcat. It’s slight confusing. The /usr directory (for UNIX System Resources, not for user) is a place where shareable (i.e. between applications) read-only data is put. In Tomcat’s case, this is used to store Java classes for use by the JVM. The directory is referred to as CATALINA_HOME, an environmental variable which refers to Tomcat’s servlet container’s (i.e. Catalina) home directory, which itself symlinks to Java’s actual classpath. That way, Java can see all of the necessary classes when running your Tomcat app. /var (for variable) is used to store things that change, like logs, databases, websites, etc. Therefore, this is where we normally put the Tomcat web apps. Thank you for this very helpful post. I was able to set up my solr instance on GCE, however I am looking for advise on calling the service from python code using pysolr. I am not sure how to send authentication parameters. Can you recommend what is the best way to access this from python? I’m not very familiar with GCE or Python, so it looks like skipping the framework is the better idea; i.e. that recommendation you got on Stack Overflow. Any hints on how to add cores/collections ? At the moment there is the default “collection1”. As I’ve read, I’m just supposed to copy/paste that directory and rename the core in “core.properties” inside. But doing that gives an initialization failure “collection2: org.apache.solr.common.SolrException:org.apache.solr.common.SolrException: Error opening new searche”. For me, it worked from the beginning to the near end. But when I go to http: // localhost: 8080 / manager / html, I have an error message and I restart the service tomcat7, I always have this error. Why? I don’t know. What’s the error message? Why solr does not support pdf files? What must I do to make them bear?